This beautiful image gives a new look at Stephan's Quintet. The curved, light blue ridge running down the center of the image shows X-ray data from the Chandra X-ray Observatory. Four of the galaxies in the group are visible in the optical image (yellow, red, white and blue) from the Canada-France-Hawaii Telescope. A labeled version (roll over the image above) identifies these galaxies (NGC 7317, NGC 7318a, NGC 7318b and NGC 7319) as well as a prominent foreground galaxy (NGC 7320) that is not a member of the group. Afresh glimpse of a well-known set of colliding galaxies gives scientists a rareopportunity to observe the way the galactic bodies evolve. A newlyreleased image of Stephan?sQuintet, a compact group of galaxies located about 280 millionlight-years from Earth, shows a system dominated previously by spiral galaxies developing into onemade up of elliptical galaxies. One of the galaxies (NGC 7318b) is hurlingthrough the core at almost 2 million mph (3.2 million kph), generating a shockwave that may be causing the ridge of X-ray emission seen by NASA's Chandra X-ray Observatory. Astronomers suspect thatsome of the X-ray emission may have been caused by Supernova explosions,stellar winds and binary systems with massive, disintegrating stars. 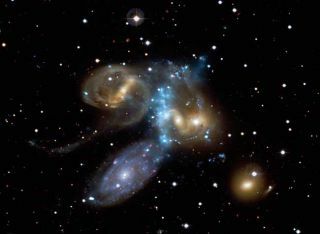 Scientists say other signscomplex interactions, such as the long tails visible in the image, were likelythe result of one or more passages through the galaxy group by NGC 7317.